What a great week for the field (and sorry to the many I’ve probably missed). Mary Kay Gugerty and Dean Karlan have a new book NOT on RCTs, but a practical how-to for other kinds of useful data-gathering. 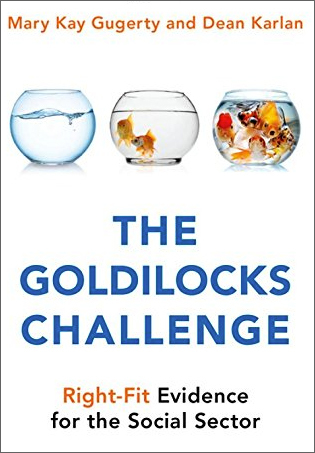 The Goldilocks Challenge: Right-Fit Evidence For the Social Sector focuses on four basic principles for how organizations (particularly social sector ones), can collect good M&E or other kinds of data to improve their work. And a whole lot of free case studies and toolkits are online. GiveWell offered their take on recent discussions of the longer-term impacts of unconditional cash transfers today. And after a few years of study, the Gates Foundation is announcing a new $138 Million initiative focusing on the causes and solutions of poverty in the U.S. I noted a few weeks ago the noticeable absence of African academic and policy organizations from many conversations about policy in Africa. Now the Hewlett Foundation has a call out for East and West African policy organizations promoting evidence-based policymaking. And you know how awesome your conference presentation is going to be, but how do you lure people to your talk? Present in a room close to where the coffee is being served, according to David Evans’ summary of a new analysis of German Economics Association conference sessions.